And I learned so much! I hadn’t even heard of egg sushi before. Neither did I know that it was okay to cook things over straw on fire in a pot nor that you have to massage squid for the better part of an hour in order to make it taste good. I also learned about Japanese fish markets and that there’s a fish/tuna shortage which I had no idea about but I guess kind of makes sense since sushi is literally everywhere in Japan. However, there’s a very good chance that the kind of in-depth autobiographical interview I desired wasn’t something that Jiro Ono wished to give. I suppose that’s fine. 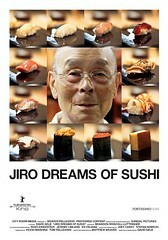 I feel that I learned enough about Jiro Ono the Person through interviews with his sons and his staff members – who generally train with him for ten years before they are allowed to make sushi for guests at the restaurant – and the few personal anecdotes he shared. (Such as his elder son thinking that he was a stranger when he came home to sleep for a few hours on Sundays and the circumstances of the only picture that he had with his father, which was dated 1927 or 1928.) I guess I just wish that the story had been told in a slightly different way? Cool I’ll check it out. In a similar vein, the el bulli documentary is cool as well. Yes, I’ll definitely check that out. I’ve been watching ALL of the food movies/TV ever lately. Lovvvve this movie. We ❤ sushi!